I feel like I should start whatever this piece of writing is going to be with a disclaimer similar to the lyrics that begin Prince’s song, “1999.” I’m not dreaming, and I’m not in an altered state of consciousness, but I do write this in a fog of news stories, live images, quotes by famous leaders, blog posts and a sense of personal hopelessness related to our country’s current issues. I should feel inspired by Occupy Wall Street, but instead, I feel defeated. I love a people’s movement as much as a lover of social justice can, as I know the fight from the ground up is the most effective way to bring about long-lasting societal change. I’m thrilled to see outrage among The 99% and to see the willingness of some of us to take to the streets. I am afraid, however, that what we want is impossible. If not impossible, I know it can’t be legislated, even as columnists advise protest organizers to carve out a list of demands they can present to lawmakers or an agenda for their own candidates. Through peaceful public assemblies, in our private discussions at home and in unspoken wishes, we the people are asking for executives of major financial and other corporations to stop being greedy. “Earth provides enough to satisfy every man’s need but not every man’s greed,” reads the sign of one protester inNew York. “Care 4 Your Country,” reads another. The bank “has a right to make a profit,” Bank of America CEO Brian Moynihan replied a day later. Out of touch as he may seem, the point of the protests is not missed on Moynihan. He has benefited immensely from living in a country where there are essentially no limits. Watching the end of a PBS documentary on Prohibition last week, I saw why the legislation of morality didn’t work. It wasn’t just because humans are humans and therefore are diverse in their beliefs and levels of self-control, and often ingenious at making a profit. It was also because, to paraphrase one of the documentary’s commentators, Prohibition told Americans, “This is the way you have to live.” In the spirit of true American individuality and freedom, we replied, “Who do you think you are?” And God help us if we become a nation that would respond in any other way. Moynihan wants the right to continue to live as he wants and to achieve all that he can. 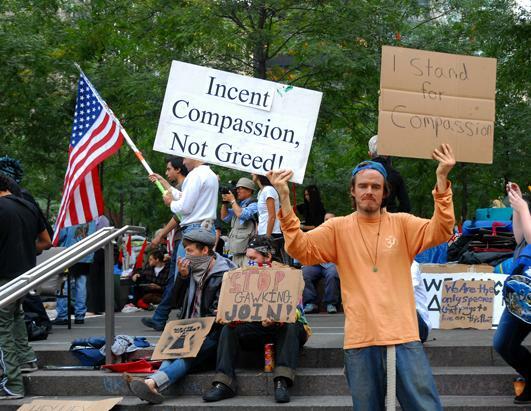 Occupy Wall Street protesters, and those with them in spirit, want the same. What those in Moynihan’s position seem to disregard is that they have benefited disproportionately from living in a country where there are essentially no limits, and their methods of reaching such high levels of achievement have created barriers for others. Protesters have said they want wars to end, capitalism to fall, the prison industrial complex to be dismantled, workers to have rights, student loans to be forgiven and more. The root cause of all of it is a thirst for wealth so insatiable it blinds the thirsty to compassion and eliminates their empathy. Rev. Dr. Martin Luther King, Jr. warned of this. “The profit motive, when it is the sole basis of an economic system, encourages a cutthroat competition and selfish ambition that inspires men to be more concerned about making a living than making a life,” he said. He called for us to become a people-oriented society, to judge success “by the quality of our service and relationship to humanity” instead of by our wealth. He didn’t say wealth and class couldn’t or shouldn’t exist. He suggested we each put people first. President Obama echoed the sentiment when he replied to Stephanopoulos that “rather than take a little bit less of a profit, rather than paying multi-million dollar bonuses,” banks could treat their customers right. And the banks could do that, but they probably won’t without being forced through regulations, and that probably won’t happen, due in large part because to some of the very things The 99% are protesting. The corporate greed has led to corporate influence on politicians who are beholden not to all voters, but rather to the people who can finance their campaigns. I don’t know that a crew of 99 percenters can take over the US House or that one could be a third party presidential candidate; it takes a lot of money to run those races, and a 99 percenter certainly can’t turn around and take donations from corporations. But I haven’t given up on politics at the local level. The 99% have to make it clear that while we are desperate to attract businesses to Kentucky, we want high-paying jobs, too. While we appreciate corporate philanthropy and want it to grow, we have to admit we need tax revenue from large businesses to continue some government-funded programs corporations will never give enough to touch. We have to demand of our city and state elected officials what we do of those elected to serve the whole country. And we can’t forget that our US legislators and executives sometimes listen to mayors and governors. Maybe I do feel a little inspired. The above post was published in The Courier-Journal on Sunday, Oct. 16, 2011. My apologies for the repeat to those who read it in print and are fans of RedboneAfropuff.com. I’m also sorry I can’t find the photos that originally inspired this; I wrote in on 10/7/2011. ← Is Phil. 4:13 destroying America?